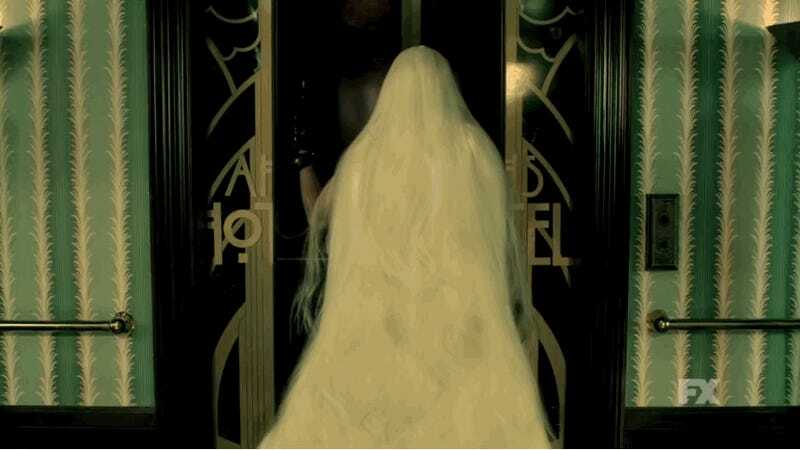 We now have the first American Horror Story: Hotel trailer actually showing its characters. And all of it is stylized with cuts and zooms to the point where you’re going to have to go through it frame by frame to see everything. The reoccurring motif of this trailer are definitely the Addams Family-style children that pop up in almost every scene. No clue what they mean, other than that there’s nothing like unnatural-acting children to add a creep-factor. We start with Chloe Sevigny and Wes Bentley as Alex and John Lowe—Alex is a pediatrician (maybe that connects to the kids somehow) and John is a detective whose investigation of a serial killer brings him to the hotel. They start holding hands and then split up, which is pretty much how all relationships in American Horror Story end up, so no huge surprises with these two. We then see the drug addict Hypodermic Sally (Sarah Paulson) stitching a body into a mattress. Two kinds of needles, get it? She’s paired with the hotel manager Iris (Kathy Bates), who hates Sally. She also stands in front of the light fixture, like the bald person did. The next bit includes hotel laundress (Mare Winningham) and James March (Evan Peters), the hotel’s owner in the ‘30s. This trailer is perfect for American Horror Story: beautiful looking, campy, and completely without substance. Even as annoying as it is that there’s no there there, it’s a pleasure to make photos and gifs out of it. Get ready for October, when yet another frustrating season is upon us.